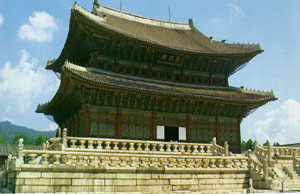 In 1394, when Seoul was established as the capital of the Joseon Dynasty, King Taejo had the Gyongbokgung Palace constructed as the main palace. wang, and Mt. Bukak, the site of the Palace was regarded the most auspicious according to the then geomantic philosophy. It had 390 halls at the time of the first completion, and other structures were added later, until all the palace buildings were burnt down by invading forces, during the Korean-Japanese War (1592- 1599). 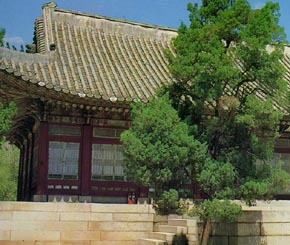 The Prince Regent Daewon-gun, father of King Gojong, restored the Palace to its current state in the 19th century. The Gyonghoeru, the venue for banquets during the Joseon Dynasty, stands on an artificial pond of square shape, making its vicinity look like a fairyland. North of it is the Hyangwon pavilion in the middle of another artificial pond covered with white and yellow lotus blossoms. 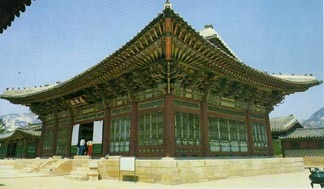 It was constructed in 1867 during the reign of King Gojong at the time of the building of the Gunchon hall. The pavilion is connected to the outer area by the Chihyang bridge. A promenade through the palace also shows you the Amisan and the Chimneys with the Ten Symbols of Longevity in the backyard of the Gyotae hall and the Jagyong hall, respectively, both of which are decorated with beautiful patterns. The symbolical or mythical objects like the Ten Symbols of Longevity and the unicorn and unicorn-lion tell much about things that the Korean forefathers considered important for the prosperity of the country and the dynasty.